The heat takes its toll. I don't want to do anything. But I know, if I spent time in the recliner napping, I won't sleep at night, so what to do. I don't want to read. Let's cross-stitch. 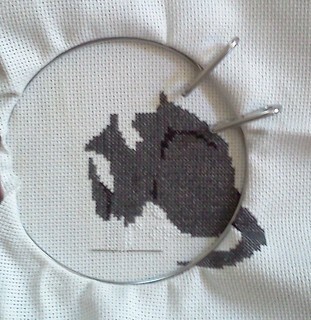 On Friday, I started but my heart wasn't into stitching. Only a little was accomplished. the orange on the photo is the incandescent light under which I took the photo. I didn't realize how bad it was until the next day, after I had emailed myself the photo and had progressed farther along in the project. Saturday, I was more into it so much more was accomplished. I started this project at one of the many Highland games I attended in years previous. Having something in a hoop was awkward and I decided, with this small design I really didn't need it. 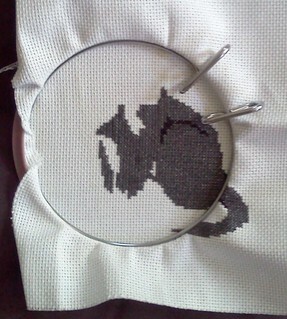 Now that I'm finishing this, it needs the hoop. The hoop provides even tension on the fabric so you aren't puckering it with uneven stitches. I don't really like this fabric. It's much heavier than usual and quite stiff, which is why I probably felt I didn't need a hoop. In reality, I should have taken some time to hand wash this before stitching to remove the sizing. Another thing I discovered was that I'd made some mistakes. I think it was the interruptions of people coming to talk to me at the games, the interruptions of going to watch something or the interruptions of being sociable with your tent neighbors. Part of this dark gray was wrong. I never considered tossing the whole thing. It's not that far from being done. I looked at the chart and looked at what I'd done and decided how to fix it. There are a few more stitches in one spot and a few less stitches in another. It will be fine. Sunday's stitching was done with a stiff breeze blowing in the north window. It was absolutely wonderful NOT to have the air conditioning on. I placed the fan to assist sucking in the breeze and the house stayed wonderfully cool. I finished the black shadow on the body and then began work on the white. Yes, there is white stitching on this. I had to put the needle at the bottom of part of the feet so you can see it. This part is slow going because the white floss is so perfectly matched to the white fabric. One other thing I don't like about this kit. The floss tangles so quickly. It's supposedly DMC floss, which I use for other projects. I didn't have this problem with the recent Eiffel Tower project. You do have to untangle your thread on occasion. It's just the nature of stitching. But I find I'm doing that about every 5-6 stitches. That slows down the project's completion. I'm not sure what the answer is other than letting the needle hang and the thread unwind. 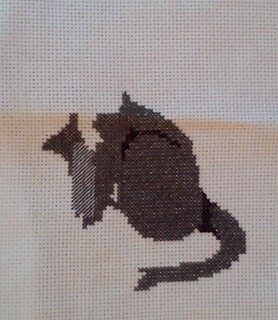 A couple more weeks of stitching and this will be done.